This entry was posted on Tuesday, July 20th, 2010 by Frances Ryan. Sometimes I find myself thinking a particular “processed food meal” sounds good but then I realize that it’s not easy to justify when cooking for one. But when an old friend from high school posted on Facebook that he was making chili cheese dogs for dinner for his family, it got me thinking that I really, really wanted one, too. Sadly, hotdogs are sold in packs of eight, as are hotdog buns. And I’m only going to eat one—maybe two—then I’m stuck with loads of extra dogs and buns. Oh, and the rest of a can of chili con carne, but at least that can be used for a lunch later in the week. Because of my “eating for one” dilemma, I find myself taking advantage of times when there are people around to share food with. And since my 11-year-old nephew is here with me all week whilst attending a fun and adventuresome week of day camp at the university, I’m taking the opportunity to cook all of those wonderfully-delicious meals that I’ve longed for—and that every growing boy loves! Tonight’s dinner? 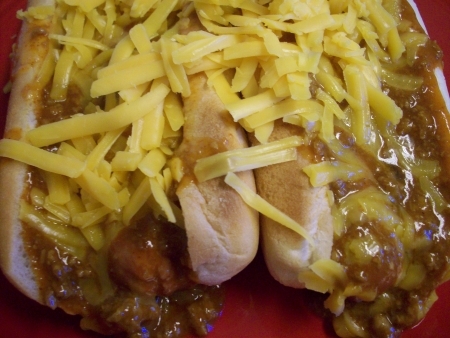 Those chili cheese dogs I’ve been thinking about for two weeks! Tomorrow we’ll have a picnic dinner at the top of Kamiak Butte and Wednesday we’ll have tacos. We’ve not decided what to do for the rest of the week, but you can bet baked tofu, curried cous cous, and arugula with low-fat goats’ cheese won’t be on the menu! It’s a good thing the kid’s only here for a week or I’d be running the risk of high blood pressure, kidney failure, and extreme weight gain! Yes, he will. And so will I. But he is my excuse for the junk end of the food spectrum!